I have to admit, I'm not the biggest fan of the Duggar show, but I am interested in how their family works, and what their story is. After all, I am a storyteller, and I love hearing other people's tales. So, when I was at the Christian bookstore, with the intention of picking up the new Jon and Kate Gosselin book, I became keenly interested in the Duggar family book. 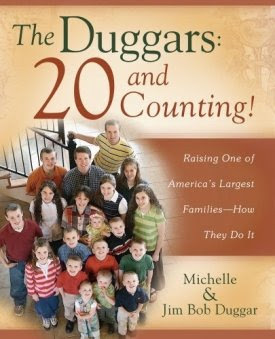 So, since the new Gosselin book wasn't really a book book, but rather a gift book/coffee table book, I decided to use the gift certificate of the month for the Duggar book! The first half of the book is mainly autobiographical, and the second half is mainly real life advice on organization, discipline, and instilling independence and values. The entire book is thoroughly filled to the brim with Bible verses and encouragement from them. I would recommend this book if you are in the least bit interested in hearing people's stories or if you are intersted in large family dynamics at all! Large families like this absolutely fascinate me! I've seen a few episodes of their show and a couple specials they're had on TLC. I might have to check this book out! Looks like i might have to read that! I absolutely LOVE their show and am very interested in them! So thanks for the insight! Even though I don't agree with a lot of their values, I find them fascinating! Such a huge family! And they have no debt!! That's just craziness to me. Glad you liked the book!